Imagine never running out of hot water. Sounds great, doesn’t it. That’s actually possible with tankless water heaters. Gaining popularity in and around Phoenix since the late 1990s this “new” technology was common in Europe and Japan a decade sooner. Sometimes called “instant” heaters, tankless water heaters are also known for their energy cost savings. 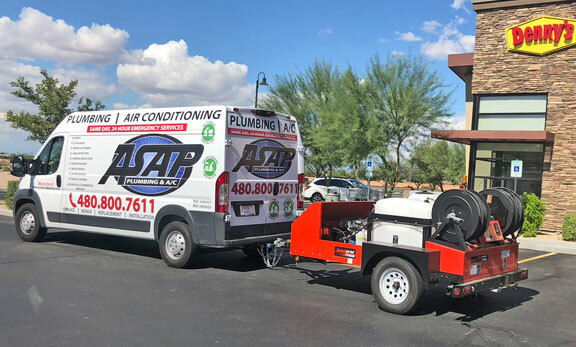 ASAP Plumbing provides affordable tankless water heater services to all Phoenix, Chandler, Gilbert, Arizona and surrounding areas. Schedule an appointment today. Everyone’s used to tank water heaters. A gas burner or electric resistance elements heat up a large tank (typically 40 gallons or more) and keep it hot until you’re ready to use it. The burner can’t keep up, so if you use too much you run out of hot water and have to wait for the heater to recover. Tankless technologies use a burner with a high-performance heat exchanger or an electric element matched to a flow rate (typically 3-10 gpm, gallons per minute) and heat only the water you use, as you use it. Today’s showerheads use some 2-3 gpm, so you never run out of hot water. Commercial installations can bank multiple units for just about any flow rate needed. Without a big tank, these designs are also extremely compact. Both gas and electric models are available, and they can be sized for a whole house or a single point of use. Electric units don’t require venting and their small size means they can be installed right where you need hot water. You’ll get it nearly instantly, without wasting time and water. Plus up to some 30% in energy savings. As with tank water heaters gas models cost less to operate. But they require an exhaust flue and often need an upgrade to a larger gas line. So they’re most commonly used as whole-house heaters. Energy savings can be as high as 30-40%, and hybrid models with a small tank can achieve an amazing 95% efficiency. Let’s be honest. These on-demand designs aren’t truly instant, but delivery is a matter of seconds if they’re installed in a kitchen or bath. The total installed cost is much higher than traditional storage tank designs and the energy costs savings may not make up for the difference. But if you qualify for federal tax credits or other incentives the balance could swing strongly in your favor. Let’s summarize the clear benefits of tankless over tank types. Heating Ability – Properly sized, you’ll enjoy the continuous non-stop hot water. Energy Efficiency – A big tank continuously loses heat, no matter how much insulation it has. Life Cycle Cost – Annual maintenance is important to keep scale deposits under control. But you can expect a 20 year lifetime (versus 8-15 years for standard designs), with warranties to match. Safety – There’s no tank that could suddenly burst and flood. Space Saving – Reclaim some garage or utility closet space. 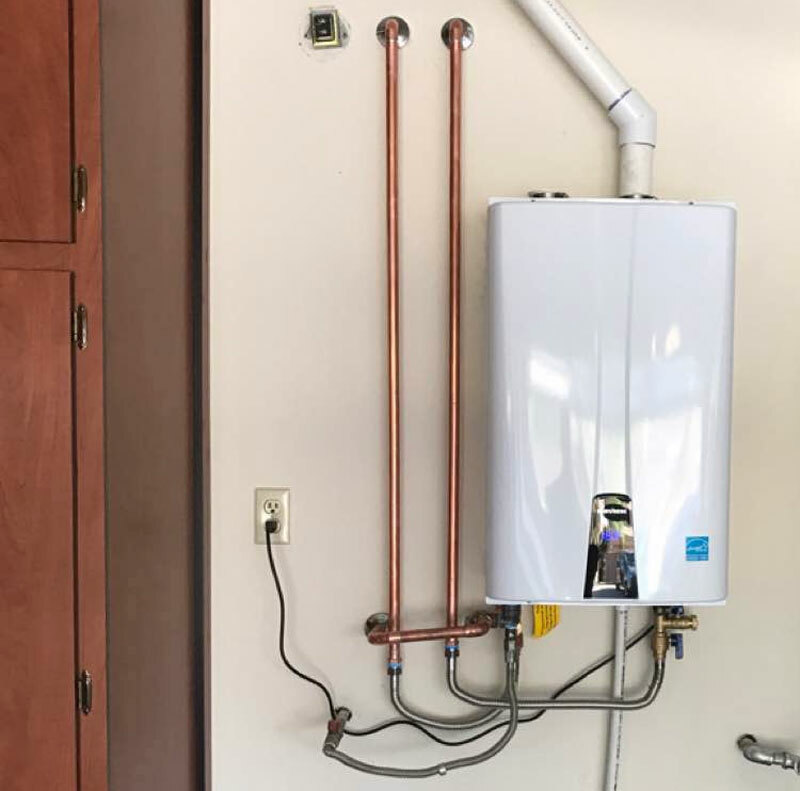 Our residential and commercial tankless water heater experts are ready to properly size and install a make and model that’s just right for your needs. We use only quality manufacturers and guarantee our workmanship 100%. We also maintain and repair tankless models as part of our full water heater repair services. Whether for existing buildings, remodeling, or new construction our experience includes single family homes, condominiums, apartments, and commercial buildings.